Information is currency for democracy. chance favors only the prepared mind". Historical background and current information that may help you better understand issues surrounding Lovejoy ISD. Rich Hickman - reelected 2005 - Election judge hired for school board election - Linda Schenck who allegedly violated elections law again, by not giving the key to the second lock on the early voting box to the sheriff. Sue Hoffman - reelected May 2004. 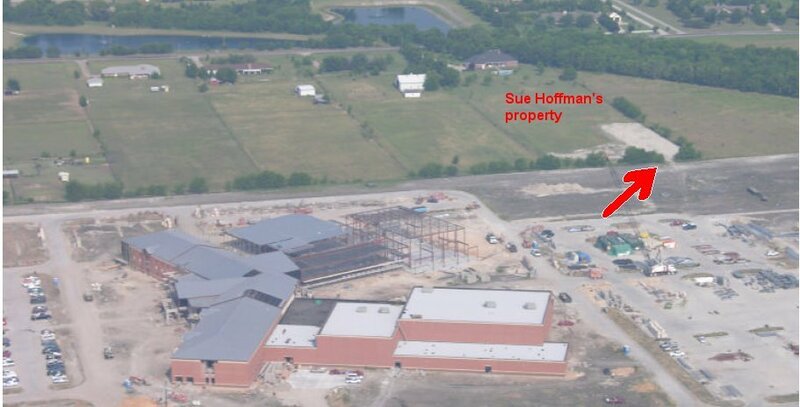 Her property is allegedly part of 28 acres for sale as "Outstanding Potential Commercial Development Site", right next to the new High School that she voted to build. John Walsh - reelected 2005 Bestway Office Supply, owned by Mr. Walsh, according to a public interest request, has sold more than $300,000+ worth of office supplies to Lovejoy. According to the information request, Mr. Walsh failed to file conflict of interest forms required by law until after the bond election to build secondary schools. Mr. Walsh still does business with the district. Served on the board when the Lovejoy "Board of Trustees authorized the termination of an earnest money contract with an effective date of November 5, 2002 (the Contract), by and between Sender Ventures, Ltd. (Seller) and the Lovejoy Independent School District, covering 41 acres, more or less, composed of all of Lot 2 and a portion of Lot 4, Forest Grove Addition, Gabriel Fitzhugh Survey, Abstract No. 318, City of Lucas, Collin County, Texas (the Property)." This property is now owned and developed by WOLF CREEK LUCAS INVESTORS LP, 2505 PLANO RD N STE 3000, RICHARDSON, TX 75082, where Mrs. Drablos is Senior Vice President and Legal Counsel. Served on school board while simultaneously serving as Chairman of Planning & Zoning, Lucas, TX where new high school is being built. Was Chairman of P&Z when comprehensive plan was changed to introduce "mixed use" (commercial, apartments and high-density housing) designation for land across the street from the Lovejoy high school site. Mr. Helm voted to build Lovejoy High School, but his child is remaining in Allen ISD, rather than returning from Allen ISD with all the rest of the Lovejoy classmates. Lovejoy ISD prematurely announced to the community that these two candidates were the new school board members before the deadline for write-in candidates had past. The Lovejoy school board also communicated verbally with the community in public meetings and informal neighborhood meetings held in the private homes of individuals who supported building schools. Less than 10% of the Lovejoy community attended these meetings which were held 2 days before early voting began for the Feb 1st Consolidation (with AllenISD) election. The information introduced at these meetings was never provided in writing to all Lovejoy residents by the Lovejoy Board and administration. Lovejoy superintendent, Carol Ray told a citizen that the school sites were not properly marked because she did not want site locations to affect the outcome of the election. All of this information was critical in making an intelligent decision, yet it was not shared with the public, only at these meetings and only because direct questions were asked from concerned members of the community. Robert Puster stated that separation would be riskier (than consolidation) for LISD if the economy has problems in the future. Lovejoy proposed school will lose money first 3 years. Robert Puster stated that the board's financial projections were based on today's "best" information but were not a certainty and any predictions which failed to come true would severely impact the financial picture. He said the school budget was "doable" but that finances would be "extremely tight especially during the transition phase and would remain tight". He projected from his figures the school would run in the "red" for the first 3 years at least and use up $3.5 million (half) of the district's reserve funds. He admitted that in a bad economy, additional reserve funds may be needed. The school board never investigated the financial viability of the proposed new school system in the event of either "flat" or "declining" property values. Robert Puster estimated the district might possibly survive 3 years in such a situation. If, after bonds are issued, property values decline, Mr. Puster stated that property taxes could exceed the $2.00 property tax cap. Incomplete information shared with community. Rich Hickman stated that the school board never distributed to the community any information about the benefits of consolidation because they felt everyone already knew how great the Allen educational opportunities were and that Allen was a "known commodity". 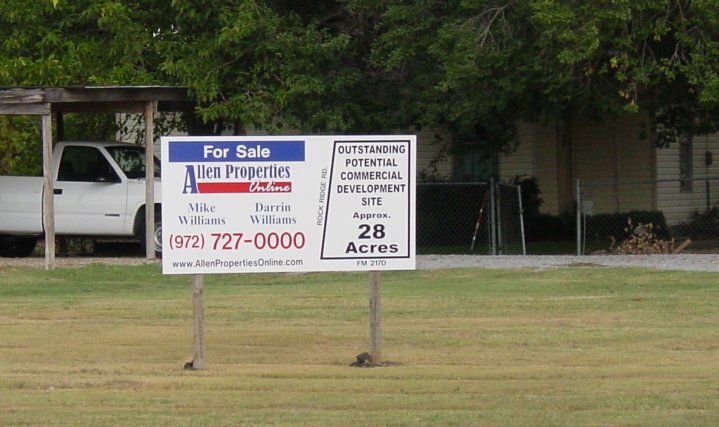 Robert Puster stated that although a separated Lovejoy District's property tax rate would be lower than Allen's for 1 or 2 years, they would also be higher for 2 or 3 years longer than Allen's so "there's not a lot of tax difference". He also expects the M+O rate in both districts to move rapidly to the $1.50 per $100 value cap and "remain there for the foreseeable future". Consultants did not recommend separation. The Moak, Casey report filed 10/02 does not recommend separation. It did say that a recommendation for separation or consolidation would "require additional analysis of the budget implications for each scenario". The TEA recommended that Lovejoy consult with a school finance expert in Region 11, but the Lovejoy Board opted not to follow this advice. Lack of Community support in year 2000. Mr. Puster stated that the board had conducted a survey of the LISD residents on the subject of separation 3 years ago and found, with 50% of the surveys returned, that the residents were "60-65% AGAINST separation". Robert Puster stated that the reason the majority of Lovejoy residents had wanted consolidation in year 2000 was due to concerns about having higher taxes if Lovejoy built their own secondary schools. Information Lovejoy board shared with the community before bond election. Bond Presentation from official Lovejoy ISD web site. Flyer from concerned citizens who later formed CUE. PAC headed up by Brenda Rizos. The opponent PAC was "Committee for Lovejoy Schools", headed up by Elena Westbrook. Committee for Lovejoy Schools PAC opposed consolidation with Allen ISD. The PAC was headed up by Elena Westbrook, member and contact for the local Covenant of Unitarian Universalist PaganS (CUUPS). Elena Westbrook ran for school board unopposed in 2003, backed by then Lovejoy ISD superintendent, school board members and her PAC supporters. Ms. Westbrook is still a Lovejoy ISD School Board Trustee. Official Lovejoy/Allen Consolidation Election Judge, Linda Schenck sent a postcard to Lovejoy ISD residents, just prior to the election. Linda Schenck was selected by Lovejoy to be a member of the "Committee of 40" which voted against consolidation with Allen ISD. Linda Schenck should have remained neutral considering her position as Election Judge of the Feb 1, 2003 LovejoyISD/AllenISD Consolidation election, instead she used her position as Republican Precinct Chairman to state her opposition of consolidation with Allen ISD. 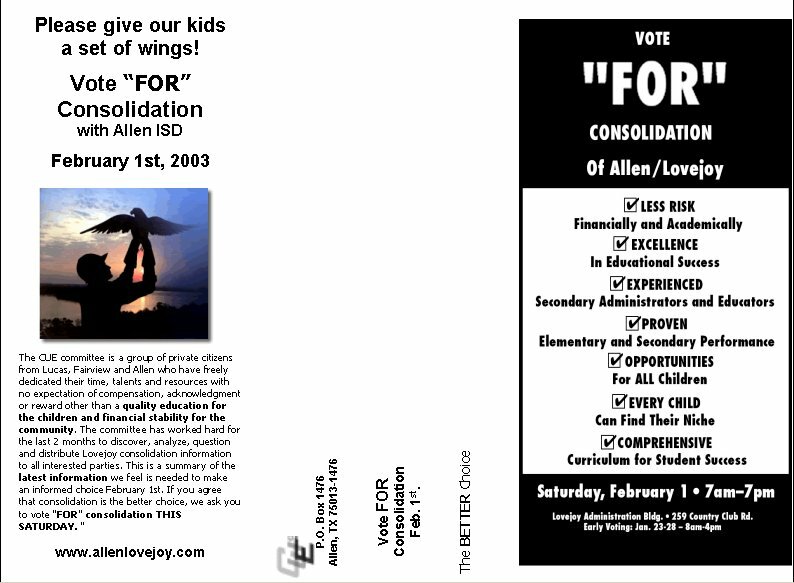 Lovejoy ISD/ Allen ISD Consolidation election, Feb 1st, 2003, had only one lock and a seal on the early voting ballot box. Lovejoy was informed by the Secretary of State's Office that a second lock must be placed on the box. No additional lock was placed on the ballot box as required. Section 85.032 of the Texas Election Code requires the ballot box in which voters deposit their marked early voting ballots to have two locks, each with a different key. In addition to the locks, the box must be kept sealed with seals that have unique serial numbers. The early voting clerk keeps the key to one of the locks, and the constable (or if there is no constable in the area, then the sheriff) keeps the key to the second lock. Some proponents of the merger have complained that an election judge, who will work during the election at a voting precinct, has circulated postcards opposing consolidation. 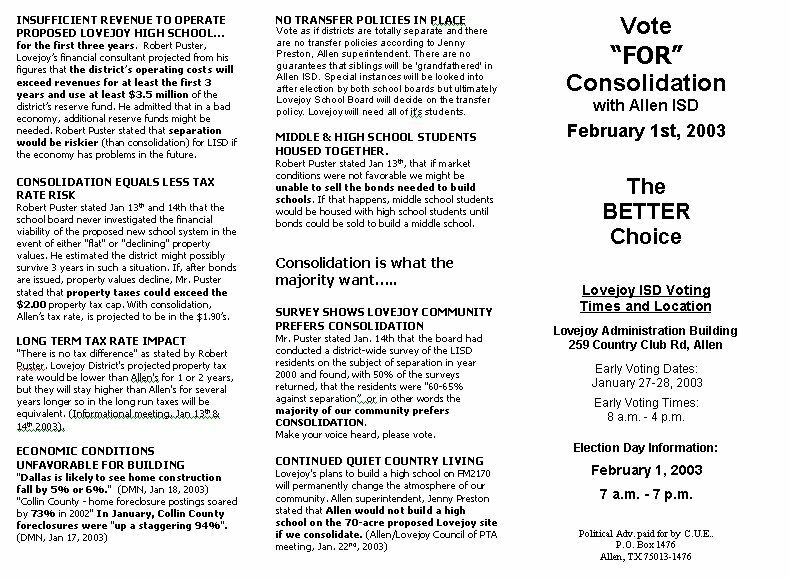 "Vote against consolidation," Linda Schenck wrote on the postcards mailed to voters. Lovejoy Superintendent Carol Ray said she was aware of the postcards and voter concerns but said Ms. Schenck wasn't in conflict with voting laws and that she had a right to express an opinion. Ms. Schenck couldn't be reached for comment Thursday. "My understanding is, they [election judges] don't lose their freedom of speech rights," Dr. Ray said. "I know her to be a woman of integrity. She's not a school employee. She's just an election judge." Lovejoy ISD has continued to employ Ms. Schenck in the following three elections, which includes a $61 Million Bond Election and two school board elections. She is currently employed as Election judge for the May 2005 School Board Election. How did Allen High School win this prestigious award? (converted from a Word document so formatting is very bad in some places) This is an excellent "birds eye" view of what Allen High School has to offer. Allen High School SAT, ACT scores. Allen High School Course Offering & Proposed Lovejoy High School Offerings comparison. Individual elementary scores not available online. 2002 TAAS comparison charts for Texas, Lovejoy, Hart and Allen elementary schools. Provided by a Lovejoy electrical engineer, James Adams. Thanks for the work you put in on this James! Did you know that Texas school ratings are determined on the number of kids who make a 70 or above on TAAS? Does that really tell us what we want to know? How about Allen High School? Lovejoy special needs are handled by the Collin County Coop. "St. Michael the Archangel, defend us in battle. Be our safeguard against the wickedness and snares of the devil. Restrain him, 0 God, we humbly beseech Thee, and do Thou, 0 Prince of the heavenly host, by the power of God cast him into hell with the other evil spirits, who prowl about the world seeking the ruin of souls. Amen."